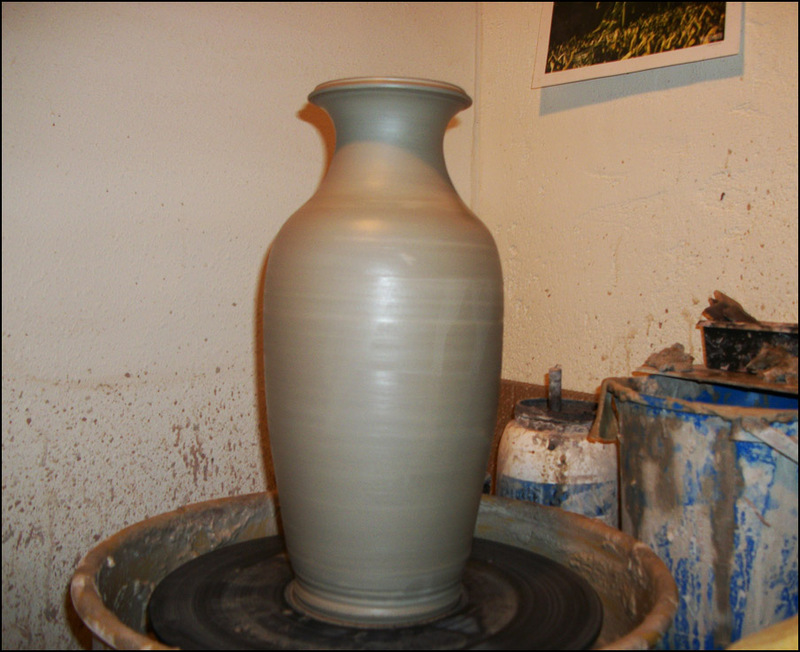 Thought #1: This weekend I didn't get to spend any time in the studio because I was too busy doing other (awesome) pottery-related things. Thought #2: I'm very pleased to announced that I have been selected to have my work carried in the Dahl Art Center Gift Shop in Rapid City, SD! Thought #4 (and onward): Got up early Saturday morning to drive some work over to the Dahl and run some other related errands. They were kind enough to accommodate an out-of-town artist with a weekend intake for my work, and I was glad for an excuse to head to "the big city" as it's called (maybe?) by West River folks. 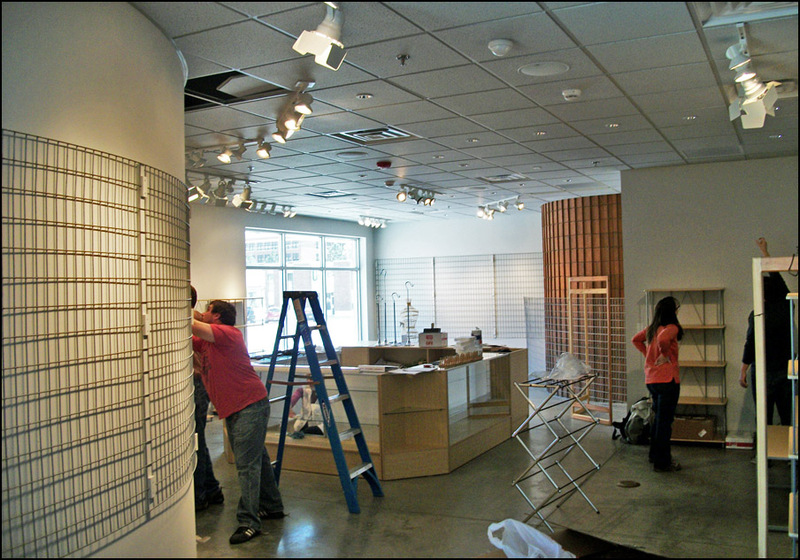 Hard at work, getting ready for the grand opening! Certainly enjoyed getting to pay a visit to the Dahl and check out the current exhibits (stunning) and meet some fine folks. Anna Marie Thatcher (not MaryAnne, as I had written in my notes) handled the intake of my work with great care and attention. Intake. IYFC Bowls, now at the Dahl! Well, after May 1st, at least! 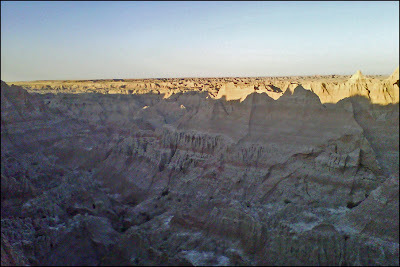 After taking care of business, Krystal and I ran some necessary errands before heading home via Badlands National Park. On account of it being "National Parks Week" there were no park entrance fees so we thought it would be worth our time to make the stop regardless of how much time we would have. Got in on the daylight-side of dusk and enjoyed some moderate hiking to enjoy some vistas. 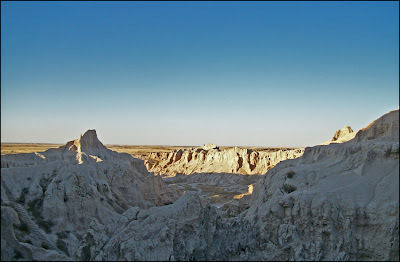 And then the "moderate hiking" took a turn toward "scrambling on narrow ledges of sheer limestone and scree." At dusk. With the sun setting more or less in our eyes. We've made enough poor decisions in our hiking days (Krystal would say that I've made poor decisions in our hiking days, but as Obi Wan Kenobi once posed, "Who's the more foolish: the fool, or the fool who follows him?") to know that there's no pride lost in cutting losses and heading for home. So we made our way back down the cliffs back through the canyon to our car. Made another quick stop at a fully accessible trail (more our pace at the end of the day. Oh, did I forget to mention the gale-force winds? Cause, yeah, there was that. It is South Dakota, after all.) with additional vistas quite extraordinary. Also: dead batteries in the camera. So, here's a parting, blurry shot from the phone to pay absolutely no justice to the view. Anyhow, good times. Sort of a long day to be spent driving to and fro, but hopefully for reasons fruitful. Ought to remember to take the camera downstairs while I'm in the studio this week. Doing a lot of heavy throwing, and being quite picky about what I keep and what goes back to the wedging table. 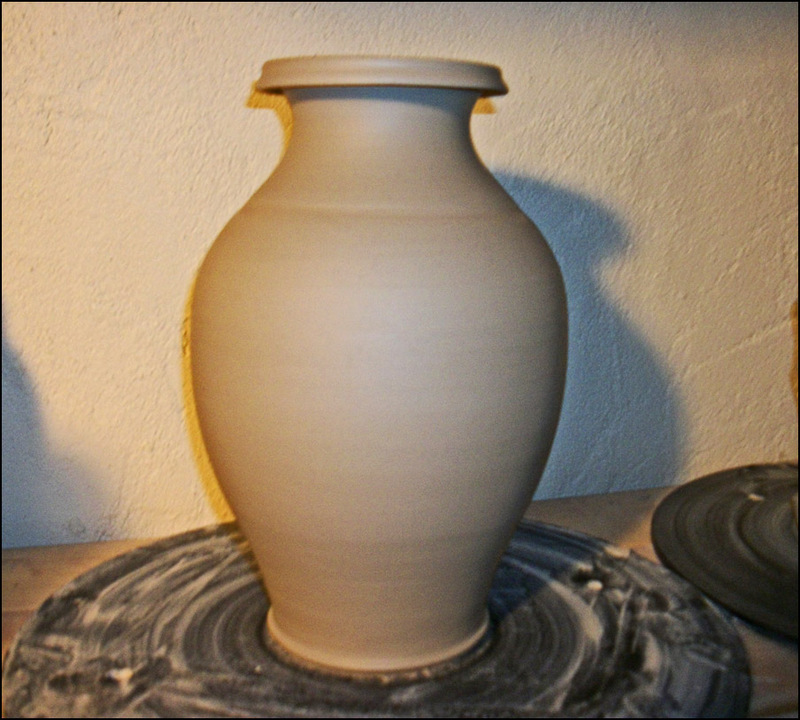 Especially in the form of vases. Whether I've explained it or not I'm not sure, but I find that even when vases aren't selling, vases and vertical forms are a strong judge of throwing capacity. A measure of control and focus, of vision and technique. So I'm thankful for the practice, and keeping more than I'm throwing out, for now at least. 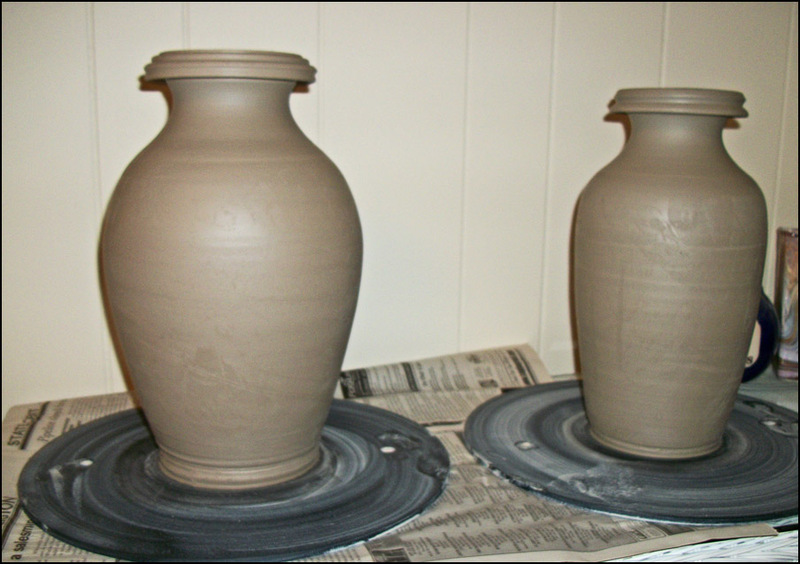 But no matter how much I throw, I can only keep so many vases on hand. Because the fact is, vases don't sell like bowls or mugs. And they take up a lot of space in the studio and the kiln and the storage bins and traveling to and from shows. So I'm trying to be picky and only keep the "top-shelf" pieces. So there's that. 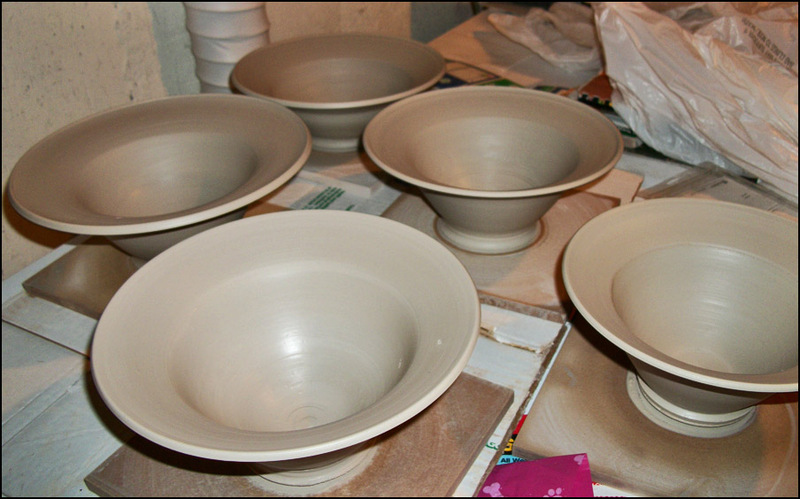 I mean, also throwing bowls and such. After the trip to the Dahl and a couple boxes that have to go in the mail this week I'm almost out of all those pretty blue bowls! So I'll need to make more. And that's that. Happy Monday to you all, wherever you are. First of all, a great big "Thank You!" to everyone who came out to the Zonta Spring Craft Show at the Pierre Mall this weekend! An even bigger "THANK YOU!" if you stopped by my booth to say hi and chat with me about my work, and a ginormous "THANK YOU!" 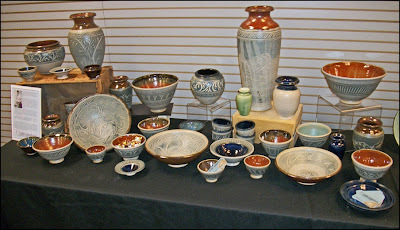 if you purchased some fine ceramic goods from yours truly. 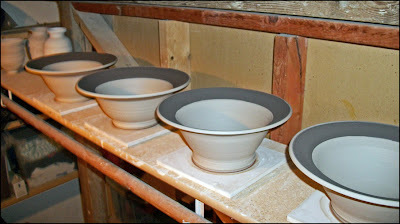 Sending my pots off to good homes is certainly a wonderful thing, and I so greatly enjoy making those personal connections. Thanks also to the local Zonta membership who made the show possible, and everyone at the Pierre Mall. It was a great weekend to be indoors: cold and blustery (read: windy) on Saturday and near-squall conditions on Sunday with windblown rain coming down in sheets. Once we got out of the elements, the hardest part of the weekend for me was probably getting set up right next to "the Cake Lady" and her crew. Because, you know: cake. And cheesecake. And cupcakes. And pie. Did I mention cheesecake? Anyhow, I managed to exercise great restraint and only had one cupcake after lunch on Saturday and a slice of pie after lunch on Sunday. And I brought home a cheesecake at Krystal's request. And a Raspberry Champagne cake that went into the freezer for a special occasion. But that was it. Yikes. Self control. Whew! The "booth." As usual, click on any of the pictures for a closer view. I had a fantastic time this weekend. I got to send several significant pieces off to new homes, which is always a good feeling. 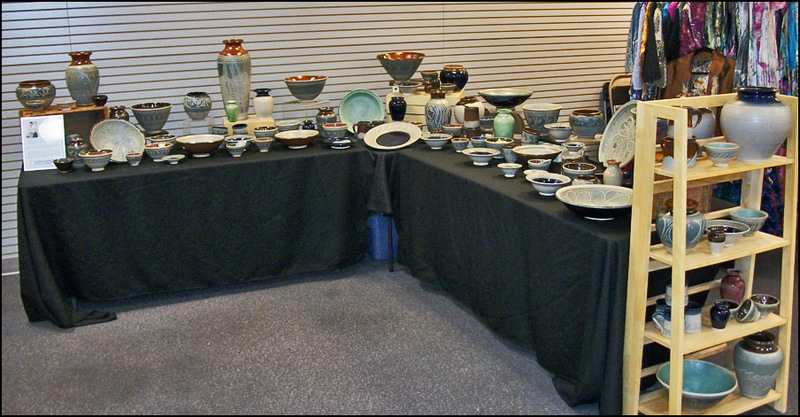 It can be a little discouraging with some of the larger pieces – bigger vases and wide bowls and large chargers – unpacking them for a show, and packing them back up again after. And those are fun pieces to make, so as long as they’re in stock, I’m not making more of them. All that to say, it was great fun knowing those works are just as appreciated and valued. I’m looking forward to going back over my inventory and seeing what sold, what didn’t, what am I short on and what do I really not need to make again for a while. Looking forward to getting back into the studio, pushing myself, pushing my style, playing around and mixing things up again. It’s surprising also at the end of a sale to see what hasn’t sold as well. I had mugs (with handles!) in stock for the first event in several years, and I think I only sold one. Bizarre. The gorgeous cobalt bowls? Sold a couple, but not as many as I thought I would. It’s a funny thing. I mentioned that I love that personal connection, sharing the stories behind the work in addition to what is seen on display. 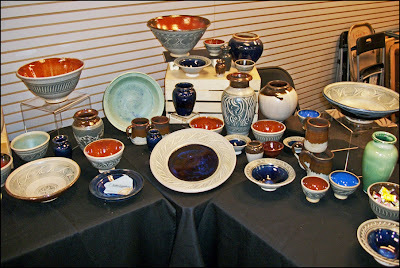 I had a number of folks who came up and chatted with me for ten, fifteen minutes about my pottery – about the process and my story with the art form. Talking about the design and decoration, where it comes from, where it might be going. Folks that wondered about how I fire them, and how do other potters fire theirs, about the variety that is found within the umbrella of “pottery.” People that were engaging with and learning about the art, in addition to learning about me and my work. And many of them took a pot home. But plenty did not. And you know what? That’s fine! Because my love of the work and my passion for sharing it with others goes beyond nickels and dimes and inventory and sales and business plans. And I would rather spend my time engaging with people in a real and personal way than just try to sell them more stuff. Because it’s worth it for me to be able to share the joy that I take from the process with others, that they might further enjoy the pottery, that our joy may be made complete in the shared experience. A woman stopped by early in the day on Saturday, drawn to the small cobalt bowls with sgraffito on the broad, flared rims. 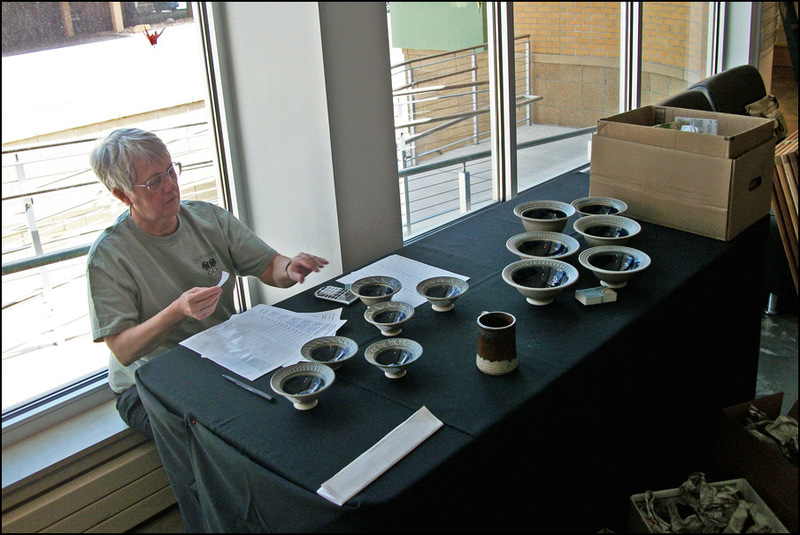 She knew she wanted to take one home, but to decide which one; we had eight of them lined up and she was so attentive as she compared each to the other, weighing the design work to the varied depths of the glazes and bowl heights. It was a process to find just the right one. And it made my day. Someone who appreciated the work and recognized the distinct individuality carried by each of the bowls on the table. Not just a question of picking something at random because it was a pretty, but finding the right bowl, the right piece. The one that belonged to her, if she only took the time to find it. That’s what the show is all about. That’s what I don’t get out of putting my work in galleries or gift shops or selling online. That human connection, that unique experience. Engaging in a shared joy. That’s the story for now. Check back soon for (potentially) exciting announcements regarding my pottery and new work as I get back into the studio again.